Explore the impact of Immuno-Oncology and precision medicine research advancements and gain deeper insight into the etiology of human disease. Presented by USC’s Keck Genomics Platform and Illumina. Join us for an exciting daylong symposium, where we bring together thought leaders from across USC's academic and clinical enterprises and friends from biotech industry. Engage in discussions about integrating NGS technologies to advance your research, bringing game-changing therapies to market and/or to collaborate in designing and implementing high-impact translational studies. 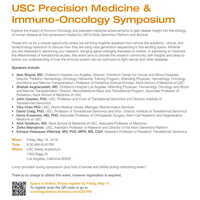 This event will provide USC's research community with extraordinary insights and ideas to further our scientific understanding of how the immune system can be optimized to fight cancer and other life-threatening diseases. Presented by USC’s Keck Genomics Platform and Illumina.